Two things about me. 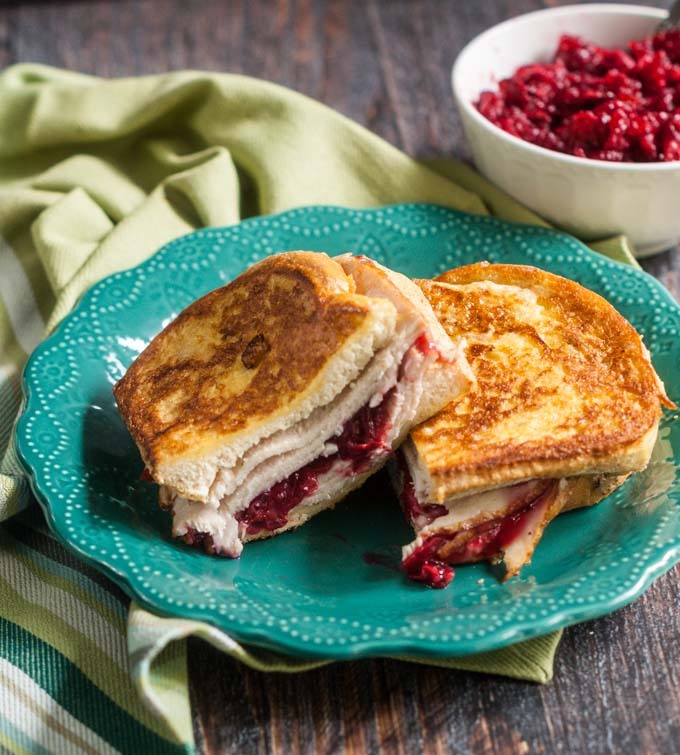 I’m not a big Thanksgiving food person and I just had my first Monte Cristo sandwich this past summer. 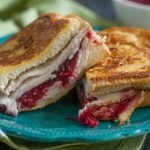 So when I was trying to think of things to make with turkey and cranberry sauce, I remembered that delicious sandwich from the summer and came up with this Thanksgiving Leftover Turkey Cristo. It was fantastic! Really it is. You have the juicy turkey, sweet but tart cranberry sauce and then I used some mayo and herbs to make a special sauce. It was like the best of Thanksgiving dinner in a sandwich. Let’s start with the cranberry sauce. I wanted to make a sugar free cranberry sauce and I came up with a recipe. This was harder than it sounds because I have never tasted cranberry sauce. I know I’m strange right? I had to wait until my husband came home everyday to see if I got it right and now I’m hooked on the stuff. Funny how your taste buds change over the years. Anyway you can use any kind you want; jellied or sauce. Now for the special sauce. It’s merely mayo with poultry spice, sage and thyme. That coupled with the grilled bread gives you the stuffing vibe. It really adds to the sandwich so don’t skip this! 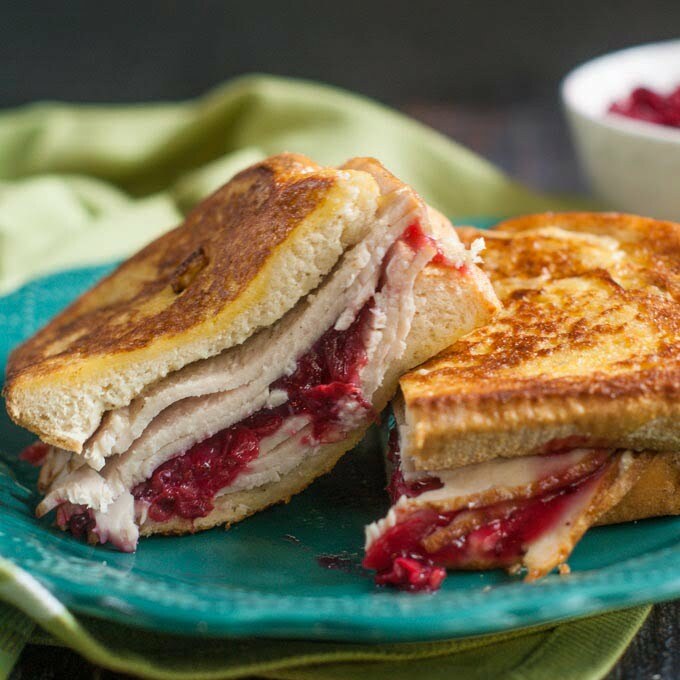 The Monte Cristo aspect of the sandwich is just a dip into some beaten eggs and then grilled in a pan. Make sure to use thick bread so you only get egg batter on the surface of the sandwich and not the filling. 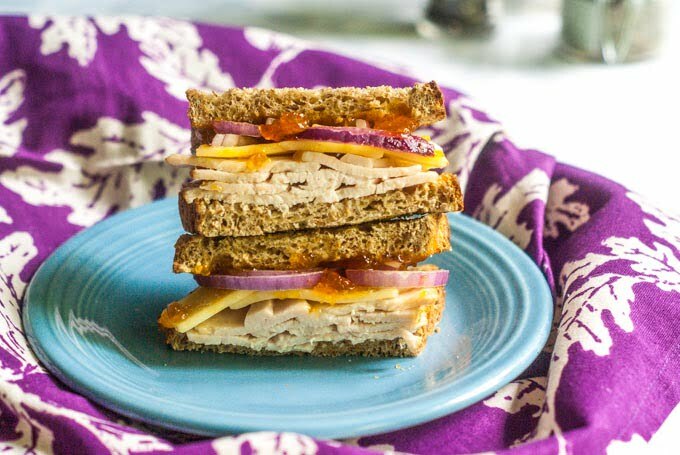 I think I like this sandwich so much because I like turkey sandwiches in general with a sweet jam-y element like this turkey apricot cheddar sandwich I made in the summer! So that is my turkey leftovers solution. What do you do with your Thanksgiving leftovers? Drop me a line and let me know if you have a good dish for me! Enjoy! In a small bowl mix the mayonnaise thyme, poultry seasoning and sage. Spread this mixture on each slice of bread. 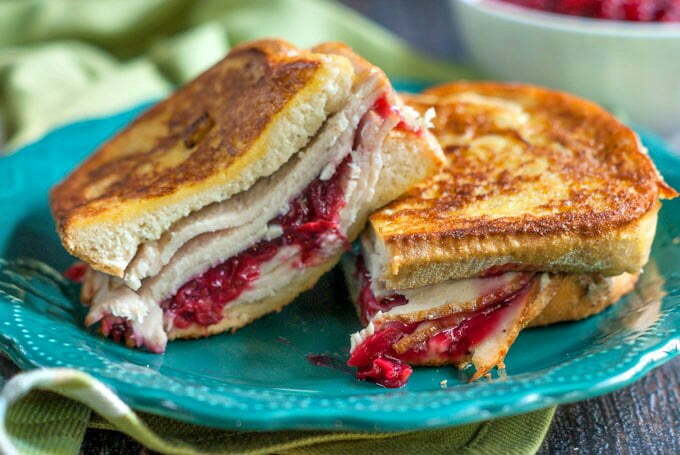 Add half the turkey on each slice of bread over the mayonnaise. Top one of the pieces with the cranberry sauce and put both pieces together. Try to compact the sandwich together to make it more sturdy for the egg dipping. Beat the eggs in a shallow bowl and then dip both sides of the sandwich with the egg. Add butter to a skillet and grill both sides of the sandwich. Note you will have enough mayo and eggs to make two sandwiches if you want. What a great idea for leftovers! Or any time of the year really. Yum! What a great idea to use up those Thanksgiving leftovers! Pinned and sharing. Thank you for linking up at Family Joy Blog Link-Up Party this week. We hope to see you back again starting Sunday at 12 EST. I’m a new follower. I found this luscious idea at Carlee’s Throwback Thursday. I can’t wait for leftovers to make this! Pinned and Yummed! Thanks for the idea. Aw thanks Linda! I hope you like it. I want to try this sandwich!! I love jellied cranberry myself, Cant wait to eat this while putting up Christmas decorations the day after Thanksgivibg!! Aw thanks Gretchen! That’s so nice you stopped by! I really liked it but then again I’m new to Monte Cristo type sandwiches. I hope you like it! What a fantastic idea for leftovers!! Thanks for sharing on the What’s for Dinner link up and don’t forget to leave a comment at the party – Next week’s features that also leave a comment get pinned, yummed and tweeted!